Like many flowering shrubs, care must be taken when pruning a rhododendron so as not to remove next season's buds. 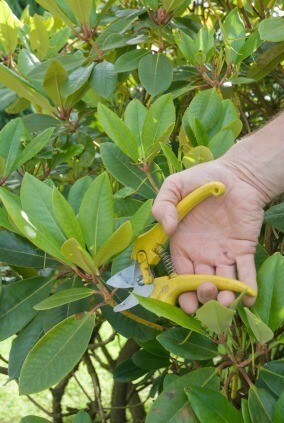 This is a guide about pruning a rhododendron. Q: I have 2 large rhododendron bushes in the front of the house that were planted by the previous owners. The flowers are absolutely beautiful but the bushes are growing out of control. Is is possible to prune them back without losing the blooms? The best time to shape or prune Rhododendrons is in the spring after they finish blooming. Before doing any cutting, look to see if there are small shoots near the base of the shrub. Hopefully you will see some new growth (on the old wood), which is an indicator that your plants will survive pruning without problems. You can cut all the stems/branches back to about 12 inches. Just make sure you keep the shrubs adequately watered during the summer months. If you don't see any new growth at the base, you might be better off selecting only a few branches to cut back this spring, and wait to see if new shoots emerge during the summer. If they do, you can finish the job next spring. Rhododendrons rarely need pruning, so once you get yours under control, it's likely it will stay that way, although you may want to continue to remove any dead or diseased wood on an annual basis, as soon as the shrub is done blooming. You can prune your rhododendron immediately after flowering and it will not harm the flowers for the following year. If you prune before it blooms in the spring, you will lose the flowers. As a general rule of thumb, prune flowering trees and shrubs immediately after they finish blooming. Many buds are ready for the following season this year. This way, you force the shrub to make new blooms and don't lose the beauty. If you prune after the shrub has set its buds then you have pruned away all your blooms and it will not flower. It's quite easy to prune Rhodos. I had out of control rhodos and went looking for pruning help on the internet and found the following link to be quite helpful. I waited until all blooms had fallen off one spring and then drastically cut the plant back. After just two years, the plant is the desired size and shape. Each year after all blooms have dropped, I prune it back to the size I want. I have my theory and my husband had his theory! We had a Rhodendron by our back porch, hubby would only trim the old buds and we wound up with a big skeleton of a bush, in my opionion. No leaves on the inside and leaves on the outside. It was a bird haven inside. cut it to the ground and had a hard time keeping it from coming back with new growth. My theory is if the bush gets to the point I am not happy with it, I can forgo buds for the next year just to get the plant cut down to proper management with thick inside branches and leaves. My feeling is a plant needs to get new growth inside the bush ... sometimes pruning drastically gives you a beautiful rejuvinated bush. We had one on the front the corner of the house that was getting too big and wirey, and he cut it down and let it start fresh ... very pretty. Would do it again in a heartbeat. Prune your rhodie after it blossoms, but before it starts to set buds for the following year. I've had the same problem and am now making it into a "tree." shape. This way I can see out the windows on the lower level of the house..
Also, dont forget that you can stick those prunings into the ground and make new bushes if you like. I planted a pjm rhodo two years ago and it has never bloomed. Should I trim it back? It has lots of leaf growth and is supposed to have lovely small blossoms, but I haven't seen any yet. What is the proper technique to prune a rhododendron bush?